If you've held off on buying Apple's new 12-inch MacBook over concerns that Intel's Core M processor may be too anemic for your computing tasks, the second generation notebook could put those fears to rest. A recent leak suggests that Intel's Skylake architecture will be arriving in the next MacBook models, bringing improved performance to Apple's extremely thin and light laptop. Previously leaked Intel slides reveal that the Y series Skylake chip, which is the fanless architecture used on the MacBook, could deliver up to 17% faster CPU performance and 41% faster GPU performance. Intel revealed that the integrated Gen9 graphics of the Skylake processor can drive up to three 4K displays at 60 frames per second. Apple may use several different variants of Intel's Skylake-based Core M processors on the MacBook to target different price points. Like the Core i processors on the MacBook Air and Pro series, Intel may rebrand its Core M processor to target different tiers, with a Core M3, M5 and M7. The base MacBook is speculated to arrive with an Intel Core M3 processor when it gets refreshed. The Core M3 6Y30 CPU will be a dual-core CPU clocked at 900MHz that can go up to 2.2GHz with Turbo Boost. The chip will come with 4MB L3 cache, integrated Intel HD 515 graphics and a 4.5W design. It's believed that this chip will slot into the base $1,299 (£843, AU$1,812) price point of the current entry-level MacBook. There may be two mid-tier MacBook models with Intel Core M5 processors. A lower configuration 6Y54 model will be clocked at 1.1GHz and can go up to 2.7GHz with Turbo Boost, while the higher-end 6Y57 can go up to 2.8GHz with Turbo Boost. Like the Core M3 model, both Core M5 configurations will come with Intel's integrated HD 515 graphics. It's expected that the higher-end configuration will be priced at $1,599 (£1,038, AU$2,231), according to MacRumors. A premium MacBook with a dual-core Intel Core M5 6Y75 processor clocked at 1.2GHz may fit in at the $1,749 (£1,136, AU$2,440) price point. The Skylake processor on that model could go up to 3.1GHz with Turbo Boost. The Intel HD 515 graphics is part of Skylake's Gen9 graphics. Even though processor performance is getting a boost, the most impressive improvement that Skylake delivers over Broadwell is graphics performance. The leaked slide suggests that we should see a 41% improvement in performance. 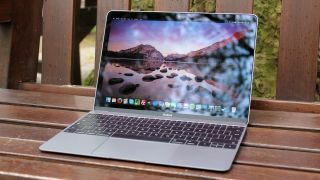 In fact, two Intel insiders with knowledge of the company's plans informed techradar in an interview outside of IDF 2015 that Intel's progress with improving integrated graphics performance is so good that Apple is considering ditching discrete graphics on its most expensive high-end MacBook Pro models. Our sources would not reveal if this would happen for the MacBook Pro's Skylake refresh, however. Apple currently uses discrete AMD graphics on the MacBook Pro, but Nvidia was also used on earlier configurations. Improved integrated graphics will allow MacBook users to play more graphics-intensive games on their downtime, run 3D modeling and simulation, perform data analysis and more. A leaked Intel presentation claims that the chip could deliver up to 1.4 hours of additional battery life. Apple currently rates the MacBook at 9 hours of battery life. The power efficiency of Skylake could boost the MacBook to more than 10 hours, matching the stamina on bigger, but more powerful, notebooks like the MacBook Air and MacBook Pro. Apple has not returned our request for comments about its reported MacBook refresh.